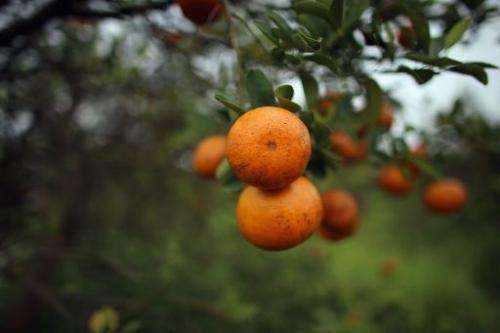 Citrus production in Florida, the world's second largest orange juice supplier after Brazil, is being threatened by bacteria from Asia that has got scientists racing for a remedy. Known as citrus greening, the bugs cause the fruit to remain bitter and fall from the tree before they can ripen. The bacteria, spread by a tiny insect called an Asian citrus psyllid, deprives the trees of nutrients. The disease can remain latent for five years before its effects start to show, and by then it is often too late, said Greg Carlton, chief of the Bureau of Pest Eradication and Control at the Department of Agriculture in Florida. "Through the years we have seen more and more insects and disease," said Carlton, who has watched the problem balloon since it first arose in 2006. "Last year about 20 percent of our fruits dropped on the ground. And we will start the harvest season in a few weeks—we are not sure whether we will get that drop again." In the 1990s, Florida citrus growers produced more than 200 million boxes, but this year that is expected to drop to 133 million, he said. Official forecasts are due October 11. Meanwhile, the costs of producing the fruit have more than doubled, from $800 an acre to $1,900 per acre in recent years, due to the high costs of controlling the pest. "If we don't find a cure, it will eliminate the citrus industry in Florida," said Senator Bill Nelson, a Democrat from Florida. "And we will end up paying $5 for an orange—and it'll have to be one imported from someplace else." Nelson helped garner $11 million in federal aid to finance research into the disease. The citrus industry generates $9 billion a year and nearly 76,000 jobs in Florida, making it an important economic engine for the southern state. 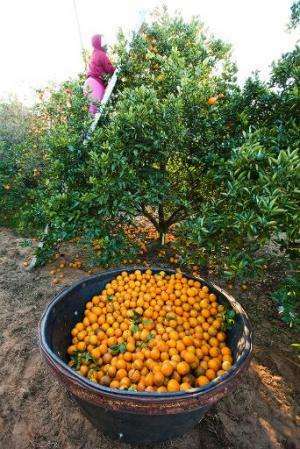 The disease has already cost $4.5 billion and 8,200 jobs since 2006, said Michael Sparks, chief executive officer of the Florida Citrus Mutual, citing a study done at the University of Florida. "We have been hit hard, but we have put our full faith in our future into research. In fact, in the last seven years we have spent nearly $70 million in research," he told AFP. Growers have cut down vast numbers of infected trees and are using insecticides more frequently, as well as providing nutrients to bolster the trees' health. Sparks described these as "significant" changes that "we believe will keep us on course until a solution has been identified." Florida is not alone in facing heavy losses from citrus greening. Texas and California have also struggled with their oranges, grapefruit and lemons. Greening has also hit Brazil—the top orange producer in the world—along with other countries. US and Brazilian experts are sharing resources in the hopes of finding a way to eradicate the bacteria. "People are thinking of making engineered plants that are resistant, like GMO-citrus," said Abhaya Dandekar, a molecular biologist at the University of California, Davis. "So now we are working to help the plant fight the bacteria." Ahhh just more of the many benefits of unrestricted globalisation and American Free Trade Agreements. Exporting weapons, drugs, poisons, playing nations off against nations... poisoning the world with GM crops - and what comes back? Ahhh just more of the many benefits of unrestricted globalisation and American Free Trade Agreements. . . .
As you're so concerned with this issue, I can reasonably expect you don't partake of any of its benefits, right? Because to do otherwise would be to implicitly support the practice. For instance, none of the equipment you used in making the above post came from outside your country. None of the logic chips, none of the copper wiring, no part of the display (e.g. rare earths), etc.